The Sri Lanka Campaign for Peace and Justice has today launched a new briefing on press freedom in Sri Lanka. you can read it here. It paints a bleak picture of life for journalists in the nation ranked 4th in the Committee to Protect Journalists’ impunity index. The murder of 34 journalists in the last 7 years – none of which has resulted in the conviction of a single perpetrator – is portrayed as the tip of an iceberg of mechanisms used to silence dissenting voices. Torture, abduction, and intimidation of family members are routinely used to dissuade members of the media from speaking out, as are the often vitriolic rebuttals by newspaper columnists loyal to the Sri Lankan Government and the postings of comments online. 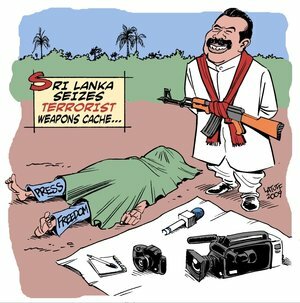 He later added, “Other reports have attempted to capture the Sri Lankan state’s attempt to intimidate journalists into silence. This report show the effect this is having on the nature of debate in Sri Lanka – and how a culture of fear and self censorship is allowing the Sri Lankan regime to go almost entirely unchallenged in Sri Lanka. “Just last week Radio Netherlands wrote about how their personnel were subject to a “white van abduction”, demonstrating that no one is safe from attack and that the situation is not improving.